“I defended Steve because I found out the wrong guy was on trial. Only way I could defend him was to sink Queeg for you." In both the novel and the film version of The Caine Mutiny, so speaks the court-martial defense counsel, U.S. Navy Lieutenant Barney Greenwald, arriving at a party celebrating the exoneration of his client, Navy Lieutenant Steven Maryk. The charges against Maryk stemmed from his having relieved Captain Queeg, his ship’s Commanding Officer, or C.O., of duty in the midst of a typhoon. Such a forcible relief would almost always lead to a court-martial, the military equivalent of a criminal trial, for the officer effecting his Commanding Officer’s removal. This article explores the legal correctness and ethical justice of the decisions by Greenwald to save his client, Maryk, by in effect destroying Queeg under cross-examination. Greenwald accomplishes this feat by leading Queeg to seem helpless, paranoid, and hopeless, spinning three tiny balls nervously in his hand. In addition, this essay shall mention the relevant secondary issues which lead to Queeg’s relief. Despite the importance of both novel and film, neither the literary narrative nor the movie version has received adequate critical examination, and most of the critical scrutiny tends to be judgmentally repetitive. Any analysis which deals with a novel and a filmed version must address the consequences of the differences between the two arts. 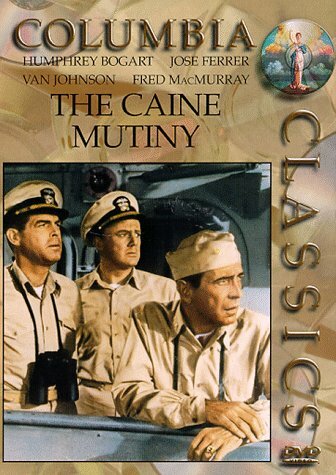 While film cannot capture the range of the novel and necessarily loses details, it also possesses the capability to create a richer experience through pictorial possibilities, and a discussion of The Caine Mutiny must keep the two mediums distinctly in mind. As the story unfolds, the ship’s executive officer, Lieutenant Maryk, relieves the captain, Queeg, on the direct issue of Queeg’s persistence in steaming course 180, due south, during a typhoon in the Pacific Ocean. After Maryk relieves Queeg, he orders the Caine’s helmsman to set course 360 (due north). In a storm, this maneuver is termed going “head up"; in other words, altering course to windward. The historical time of the story is 1944. The U.S. is then at war with Japan, and 180 is, to the knowledge of everyone in the bridge, or ship’s control area, fleet course, meaning the direction in which the entire fleet is to steer. By steering 180, also, the U.S.S. Caine is going with a following sea, with waves astern, or coming at the ship’s rear, ahead of a major typhoon. In most instances, in heavy weather, namely, with rough seas and strong winds, the ship does best to steam with waves astern, or breaking at the rear of the ship. By controlling the craft’s speed, the captain can assure that the ship will level off in the troughs, and not plunge bow-first into the back of the next wave, which might lead to its pitch-poling or somersaulting over her stern on a wave. By going “head up," or waves to windward, the person at the helm reduces steeply the chances that the ship might broach or head up too sharply, and thus lose stability. Furthermore, by running downwind, the ship can maintain the greatest interval before being struck by the next wave. In addition, by steaming at the right speed a craft can reduce the effect of the velocity of the waves. The disadvantage of steaming with a following sea in heavy weather is that this tactic exposes the ship’s stern to the heavy seas. The stern of any craft is neither shaped nor reinforced to resist the direct action of such seas. As long as the waves, however, fail to crash down on the stern and poop (that is, smashing the amidships area by the weight of a huge wave over the stern), running downwind is the most prudent and gentle manner to ride out a major storm. Maryk and the crew feared that the Caine would either broach, or else turn beam (that is, sideways) to the heavy weather (the latter can occur when a ship gets caught sideways in a trough). But whether steaming upwind, known as “head to wind," or downwind, turning beam in a typhoon remains a serious concern. True, the Caine rode better head to wind; that is, with the bow heading into the waves, as the novel indicates: “With its head to the wind, the Caine rode better." And “Butting and plunging, the Caine was a riding ship again." But the issue was not comfort. The seas were rough, but in the novel the ship shows no sign of taking on water or sustaining structural damage. Fittings did not pop, nor did compartments evidently flood in either version. In the novel, the engineering plant did not have any difficulty and responded to each of the engineers’ orders in timely fashion. The Caine, in other words, remained seaworthy, or able to survive, in the heavy weather. In novel and film, the Caine had difficulty sticking course 180, and Queeg ordered dual engines to maintain fleet course. But this maneuver proved good seamanship. Dual engines place extra stress on the fuel tanks, but provide steadier drive. Going into the typhoon, Queeg had a 40% fuel load and would no doubt have needed to refuel sometime soon. Also, he had not ballasted ahead of the storm. Ballasting involves deliberately taking seawater into the ship’s fuel tanks, in order to provide stability for the craft. But during the storm, weather would not allow ballasting, since this process requires a ship to slow to only two to four knots. With the Caine’s stern to the sea, Queeg needed at least standard speed to run the same speed as the seas. In addition, Queeg proved conscious of the fact that he was steaming with the fleet during wartime. Needless to say, typhoons were much more difficult to predict as to time and place in 1944, the historical time of the narratives, than they are today. Additionally, in today’s Navy, the ballasting process allows the tanks to filter the sea water so that the tanks remain clean and perfectly operating both during the ballasting and afterwards. In contrast, during World War II the fuel tanks proved unable to clear the salt and silt out of the seawater. After a ship had been ballasted, the fuel tanks soon became corroded. Thus, had Queeg ballasted the Caine unnecessarily, he risked disabling his ship altogether. At best, had Queeg ballasted, he would have risked propulsion if he had exposed his fuel pumps to saltwater. Queeg, as the Commanding Officer, therefore assumed that riding high with limited propulsion is better than riding heavy with NO propulsion. Queeg’s captainship decisions during the crucial “Typhoon" chapter of The Caine Mutiny, then, proved not only “sensible and sound but the best possible in the circumstances" (this according to my conversation with a Lieutenant Commander Robert Hyde). Queeg’s decisions were based on more than just “some bad weather." He was the C.O. of a destroyer-minesweeper during World War II. As far as he knew (communications had recently been severed by the storm), in steaming course 180 he was steaming fleet course. His vessel was at sea to accomplish a mission as part of a battle group. The Caine was heaving and yawing, but it was not in danger of sinking (the novel makes this fact much clearer than the Hollywood version). The crew was scared and sick and in the center of the seaway, the naval term for rough water, but it was not incapacitated. Queeg made a difficult but correct decision in the face of extreme adversity. The Executive Officer, Maryk, was wrong. Unless the ship was in imminent danger of sinking, he had no correct authority to relieve the C.O. of his duties. Why, then, was Queeg relieved? The U.S.S. Caine, a Destroyer Minesweeper (DMS—18 Caine) is tasked to serve as a Landing Control Ship (LCS) for the Marines’ amphibious landing on Kwajelein. For this operation, Maryk remains on the bridge, whereas Queeg makes sure his is the most protected spot, by the superstructure aft (to the rear of the bridge, where the ship’s steering is controlled). Some fairly ineffective shore-based artillery fire directed the Caine’s way has Queeg petrified. Some 2,500 yards away from shore, he orders that a few cans of yellow dye be hastily dumped in the lee of the Caine as the only marker ashore for the Marines in the numerous amphibious landing craft behind his ship. Queeg then orders the Caine to turn swiftly back away from the beach. Even before this, the Caine had been steaming farther and farther ahead of the Marines on the small amphibious landing craft in the Caine’s wake. Thus, by the time the yellow dye buckets had been dumped over the side, the amphtracs were almost out of sight of the Caine. At this time, the Caine’s mission, as a Destroyer Minesweeper (DMS), should have been threefold: serving as a Landing Control Ship to guide the Marines’ amphibious tractors to the correct spot on the beach to be assaulted; providing close and direct gunfire support ahead of the amphtracs holding the Marines; and clearing mines encountered ahead of the small, and lightly armored, Marine assault craft. After Queeg orders the dumping of the few cans of yellow dye, he assumes the conn (that is, control of the ship), and turns the Caine away from the beach, nearly a full mile before the 1,000-yard, officially prescribed, distance for DMS Landing Control Ships during an amphibious landing in combat. Such a precipitous retreat left the large portion of the Marine landing force behind the Caine in extreme hazard. In the film, the Pacific island landing is not named, but in the novel, Kwajelein clearly is the Marines’ objective. Kwajelein constitutes the largest atoll in the Pacific. The attack on Japanese-occupied Kwajelein took place January 30—February 4, 1944. Kwajelein was possibly the most complicated amphibious landing in history. The prospective tactical difficulties in this landing, code-named FLINTLOCK, were enormous. The atoll comprises a circle of dozens of mostly tiny islands in the Ralik Chain of the Marshall Islands. All but three of these Kwajelein islands are small. One of the major tactical problems for the U.S. landing force, however, was that the primary assault beaches were within a lagoon so that the sea-borne attacking forces were, potentially, subject to Japanese artillery fire not only from the islands directly being assaulted but also from flanking fire from the surrounding islands as the assault boats neared the beach. The protection and guidance of the Primary Landing Control Ships, such as the Destroyer Minesweepers, with their combined capabilities of employing their five inch guns and sophisticated mine-clearing apparatus, proved especially important. FLINTLOCK began with the Marine assault personnel being transferred at sea from large ships, such as Landing Ship Docks (the acronym for which is LSD) to LVTs, or amphibious landing boat tractors. On the day of the landing the seas proved very rough, and the time required to sweep the targeted harbor of mines took far longer than expected. Thus, the Marines spent an inordinate period carrying dozens of pounds of equipment in fully loaded amphtracs (26 Marines and one Corpsman—E.M.S. man). If the amphtracs ran out of fuel, they sank, since once in the water they needed to keep moving to stay afloat. With their long delays in circling around in the rough weather, some of the craft at Kwajelein never linked up with their Primary Control Ships and went down at sea. Once the landing craft did link up with their LCSs, however, were they to have had such poor guidance as provided by the Caine, then even more amphtracs would have run out of fuel trying to locate the correct beachheads. Queeg ordered the Caine to turn away from the beach at 2,500 yards. Then as now, the standard distance for which the support ships are to provide guidance, mine clearance and fire support in the U.S. naval services is 1,000 yards. On FLINTLOCK, ship to ship communications proved so poor that the Marines in the landing craft were not only unable to hail Landing Control Ships, such as the U.S.S. Caine but they were also unable to communicate with each other, not to mention the beach masters, who served from shore as guides to the landing craft. Since the amphtracs only made four knots maximum, even in easy weather, they proved ready targets for the Japanese artillery from the time the Marines had been abandoned by the Caine. In a word, Maryk’s disgust with Queeg’s cowardice, lack of force, and failure of attention to duty at Kwajelein proved the proximate cause which set the Executive Officer’s determination to relieve Queeg at the first opportunity. Less directly noteworthy for the Caine’s XO were the wardroom fiascos involving some missing strawberries and coffee. Prior to FLINTLOCK and the typhoon, Queeg has his officers investigate these inconsequential peccadilloes with an intensity surpassing the interviews done for the Nuremberg Courts. The Captain’s obsessiveness regarding these missing food stores is reminiscent of the Joan Crawford of Mommy Dearest: “no wire hangers! no wire hangers!" Neither Queeg incident, however, bears any operational relevance. Nonetheless, both episodes serve to solidify among the ship’s officers the idea that their Captain is an insane and incompetent, obsessive-compulsive individual, unfit for a U.S. Navy ship’s command in wartime. In The Caine Mutiny novel and film, however, more germane to Queeg’s problems as an operational commander is the shirt-tail incident. During a target-towing maneuver, one sailor aboard the Caine has his shirt-tail not tucked into his trousers due to a skin rash. Queeg so extensively and obsessively pursues this dress code breach that, despite numerous warnings by the helmsman, the ship circles around, severs its own towline, and destroys the target it had been pulling. To sum up, then, we recall the words of defense counsel Greenwald with which this essay begins: “I defended Steve because I found out the wrong guy was on trial. Only way I could defend him was to sink Queeg for you." Greenwald goes on to say, however, “I’m sore that I was pushed into that spot, and ashamed of what I did, and thass why I’m drunk. Queeg deserved better." As our audience can now somewhat better understand, Greenwald here spoke the truth about this case in ways even he may not have fully understood. In the crucial typhoon scene, Queeg’s seamanship decisions prove “sensible and sound"—in fact, “the best possible" decisions. This article has indicated that this is so by means of a review of the war-time tactical situation, as well as of the seamanship techniques of the period. At base, Queeg was relieved of duty because of prior incidents which “added up" against him: minor instances of obsessive-compulsive behavior, combined, most importantly, with his cowardice and lack of force during the invasion of Kwajelein. As the Skipper of a Destroyer-Minesweeper, and Landing Control Ship, his failure to support the Marine amphibious landing force constituted a serious breach of naval courage. This failure no doubt doomed many Marines and Corpsmen to death in a watery grave. Hostility to other people often is rooted in events that may have occurred hours, days, weeks, and months before the anger boils up in the guise of vituperative actions. In the novel The Caine Mutiny, clearly, and also, inferentially, in the classic film made after it, Maryk’s serious hostility toward Queeg begins bubbling to the surface directly after Queeg’s shameful and tactically dangerous decision to abandon the Marine landing force at Kwajelein. After FLINTLOCK, Caine’s Executive Officer, Lieutenant Maryk, decided that, at first excuse, “Old Yellow Stain," his cowardly C.O., would have to go.